Stuart Sutherland, founder and President of Sutherland HDL, Inc., has authored or co-authored several books on Verilog and SystemVerilog. These books are described below, along with information on purchasing these books. This book is both a tutorial and a reference for engineers who use the SystemVerilog Hardware Description Language (HDL) to design ASICs and FPGAs. The book shows how to write SystemVerilog models at the Register Transfer Level (RTL) that simulate and synthesize correctly, with a focus on proper coding styles and best practices. SystemVerilog is the latest generation of the original Verilog language, and adds many important capabilities to efficiently and more accurately model increasingly complex designs. This book reflects the SystemVerilog-2012/2017 standards. This book is for engineers who already know, or who are learning, digital design engineering. The book does not present digital design theory; it shows how to apply that theory to write RTL models that simulate and synthesize correctly. This "RTL Modeling with SystemVerilog for Simulation and Synthesis" book was written as a companion to the book "SystemVerilog for Verification" by Chris Spear, also published by Springer. As the titles indicate, each book covers a different sphere of SystemVerilog; the former on the design modeling constructs and the latter on the design verification constructs. (The example show in this second edition examples are not available for download due to copyright limitations. Most of the examples are also in the first edition, which are available for download. Download the first edition examples (UNIX tar file) and first edition errata (text file). This "SystemVerilog for Design" book was written as a companion to the book "SystemVerilog for Verification" by Chris Spear, also published by Springer. As the titles indicate, each book covers a different sphere of SystemVerilog; the former on the design modeling constructs and the latter on the design verification constructs. This book assumes that the reader is already familiar with using Verilog. It supplements other excellent books on how to use the Verilog language. The Verilog PLI provides a means to customize a Verilog simulator to perform virtually any engineering task desired, such as adding custom design debug utilities to a simulator, adding proprietary file read/write utilities to a simulator, interfacing C language models to a simulator, etc. The PLI Handbook serves as both a user's guide for learning how to use the Verilog PLI, and as a comprehensive reference manual on the Verilog PLI standard. There are two major generations of the Verilog PLI: the TF/ACC generation (sometimes called "PLI 1.0") and the VPI generation (sometimes called "PLI 2.0"). Both generations are included in the IEEE 1364 Verilog standard. This book provides equal and detailed coverage of both the TF/ACC and the VPI generations of the PLI. "This book brings clarity to the Verilog Programming Language Interface. The descriptions and examples shed new light on aspects of the PLI that had previously been murky. Stuart Sutherland has produced the definitive guide to all versions of the PLI. I highly recommend this book to all Verilog users who want to learn the PLI." Chris Spear, Verification Consultant, Synopsys, Inc. Note: The SystemVerilog standard has added extensions to the VPI libraries that are not reflected in this book. SystemVerilog has also added a third programming interface called the Direct Programming Interface (DPI), which is also not covered in this book. A handy and concise quick reference guide covering the syntax of the complete Verilog language. 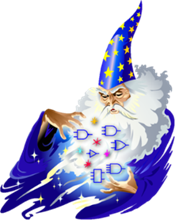 Updated to include the dozens of new enhancements in the IEEE 1364-2001 Verilog standard, such as generates, multi-dimensional arrays, C style port declarations and signed arithmetic. Professionally printed and spiral bound, this popular reference guide makes it easy and fast to look up Verilog keywords and syntax. 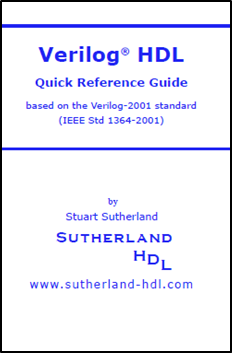 The guide is fully indexed and includes many examples which illustrate the Verilog language in context. Note:This book is no longer available for purchase, but is provided as part of the training materials in Sutherland HDL's "Verilog and SystemVerilog Language Primer" and "Verilog/SystemVerilog for Design and Synthesis" workshops. A PDF version of this Quick Reference Guide is available for free download. Permission is granted by Sutherland HDL to download and/or print copies of this reference guide for personal use only. The reference guide cannot be used for commercial purposes or distributed in any form or by any means without obtaining express permission from Sutherland HDL.